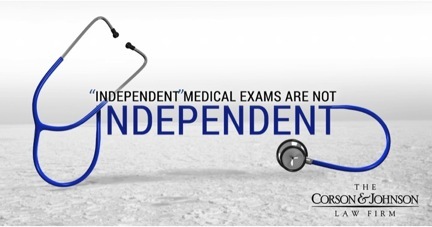 Are Exams of Injured People by Insurance Companies ‘Unbiased’? The law permits compelled medical examinations of injured people for “good cause shown,” but in practice, such exams are routine in litigation. Most folks do not know that these medical examiners do not have an physician-patient relationship with the person being examined, so there are precious few protections for the injured person. In no other context is the insurance company allowed to have a court-ordered interview of the injured person without that person’s attorney present to look out for their rights. Even worse, some judges won’t even allow video recording of these medical exams, so the insurance company’s doctor has near complete control over the record of what was supposedly said or done. Not surprisingly, that leads to abuses. The jury is never allowed to hear that the defense examiner is paid for by a liability insurance company. If the defense doctor “remembers” something favorable to the insurance company that never happened or something that was never said, there is often no effective way of showing a jury that recollection is not correct. One attorney’s personal experiences with a medical examiner showed how fighting against abuses by the insurance companies’ witnesses can come at great personal cost.